Hello ! Mary popping in to share another card using the Vintage Journal Cards, using the flower theme journal card. They make for soft and romantic cards. For this card I have used along with the Journal card a image of the lady from the cut and create sheet , the pastel enamel dots and the soft sheer green ribbon. 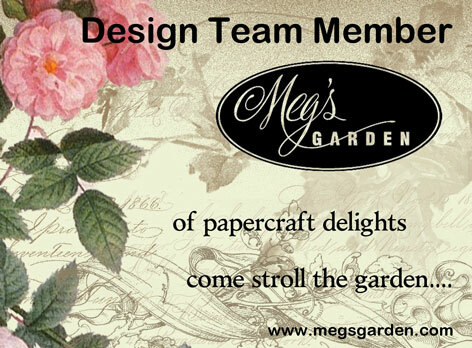 I have used the lovely water colour PP from Megs Garden as my background. Thank You for calling by and I hope you take the opportunity to visit Megs Store, these products truly inspire one to create. A beautiful card Mary,so soft and feminine!.